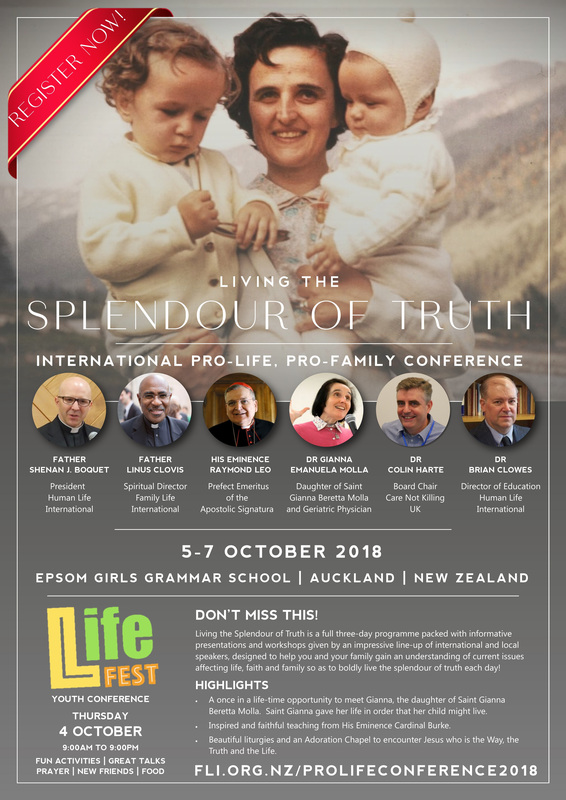 It is with great joy and excitement that I share with you Family Life International’s upcoming pro-life, pro-family conference “Living the Splendour of Truth” which will be held October 5th to 7th in Auckland. Preceding the weekend conference, on Thursday 4th October youth from all over New Zealand will gather in Auckland for the LifeFest Youth Conference. This is a fantastic opportunity for young people to learn about, in an engaging way, God’s plan for life and love. In this most important conference, you and your family will rediscover the newness of faith and gain an understanding of current issues affecting life, faith and family. I do hope that you will be able to join us for this full three-day programme packed with informative presentations and workshops given by an impressive line-up of international and local speakers. With opportunities for formation, fellowship and spiritual renewal, this conference will equip you to boldly live the splendour of truth in your families, schools and work places every day! SECURE YOUR PLACE AT THE LIVING THE SPLENDOUR OF TRUTH CONFERENCE TODAY! Hear the testimony of Gianna Emanuela Molla. 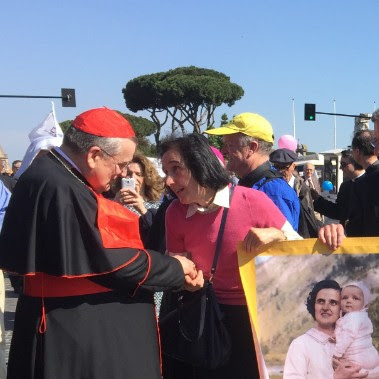 Her saint-mum, Saint Gianna Beretta Molla, was a living witness to the splendour of truth as she faithfully lived her vocation as wife, mother and physician. Saint Gianna’s great trust in God and her sacrificial love were manifested in an heroic way when, early on in her fourth pregnancy, she was faced with a difficult decision – abort, have an hysterectomy or undergo surgery which would put her own life at risk, but give her child a chance of survival. Gianna Emanuela, lives to speak of her mother’s heroic virtue, which inspires all to aspire to live a life of holiness. His Eminence, Raymond Leo Cardinal Burke, will lead participants in beautiful liturgies and encourage all to live lives that radiate Christ’s love for neighbour, while proclaiming the truth with courageous faithfulness and humility. Cardinal Burke is the Cardinal Patron of the Sovereign Military Order of Malta, Archbishop Emeritus of St Louis (USA)’ and Prefect Emeritus of the Apostolic Signatura, the church’s highest court. Father Shenan Boquet and Dr Brian Clowes from Human Life International are pro-life missionaries to the world. While in New Zealand they will share their expertise on life issues from conception to natural death, equipping and inspiring participants to boldly proclaim the Gospel of Life and to serve those in need in our local communities. The conference is inspired by two very important documents which address the moral questions surrounding life and family. Fifty years ago, on July 25th, 1968, the encyclical letter Humanae Vitae, which reiterated the Church’s constant teaching regarding birth control, was promulgated by Blessed Paul VI. In this document, Paul VI pointed out the grave consequences of using artificial methods of birth control – all of which, sadly, have come to pass. We also acknowledge the 25th anniversary of the encyclical letter Veritatis Splendor – The Splendour of Truth. In this document, Saint John Paul II reflects on the Church’s moral teaching, the natural law and the need for a profound faith, which asks us to hold fast to the person of Jesus, imitating him in love. Living out the commandments in obedience, leads to transformation and genuine freedom. This is what the world seeks, but the false illusion of freedom in sin tempts many, and the rejection of natural law, the reality of absolute truth and faith in God has become widespread with an almost obstinate defiance. One just has to look to the continuing demise of Ireland to see this played out in the most horrific way. I pray you will be able to join us for this most important conference, Living the Splendour of Truth, October 5th to 7th. You can register online or visit our website or call our Auckland office on 09 629 4361 for more information. If you know of young people aged 13 plus, please inform them about LifeFest and encourage them to participate. It will be a full exciting day of formation, fun activities and opportunities for prayer, which will help equip them to deal with the moral issues they, and their peers, are faced with every day. Unable to attend? Please consider sponsoring (or part sponsoring) someone to participate. We often have many people unable to afford the registration costs of our conference, yet they have a firm desire to participate and be active pro-life and family advocates in their communities. We never turn anyone away. If your means allow you to, please consider making a contribution for this purpose – you can do so through the online registration form. Thank you for giving this request some prayerful thought. Finally, please join me and the rest of the Family Life International team in praying for the fruitfulness of this conference, that it may truly be a time of renewal, encouragement and learning so that we can all work effectively to transform our culture into a civilization of truth, life and love.